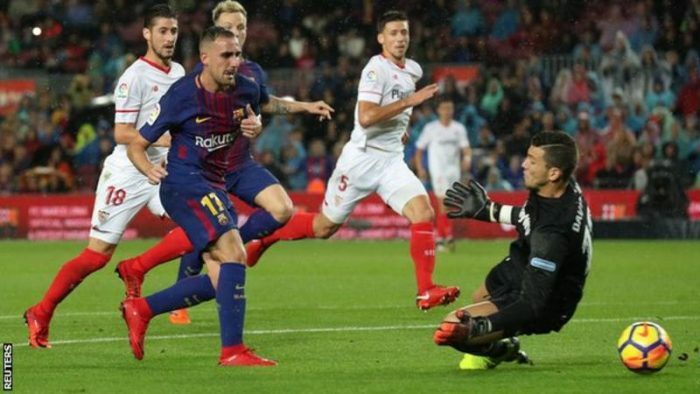 Paco Alcacer scored twice as La Liga leaders Barcelona battled past Sevilla during a rain-soaked contest. The forward, 24, played alongside celebrated pair Lionel Messi and Luis Suarez but outshone both with a goal either side of the interval. He slotted home his first after 23 minutes from Suarez’s long pass. Sevilla equalised after the break when Guido Pizarro headed in, but Alcacer put Barca back in front soon after when he poked in Ivan Rakitic’s cross. The former Valencia and Getafe forward also headed over from close range, while team-mate Gerard Pique saw his shot come off the crossbar. Messi produced another mesmeric display, albeit without getting on the scoresheet. The closest the Argentine came to scoring was when his low drive was palmed away by goalkeeper David Soria. Sevilla also went close through Luis Muriel, whose two long-distance strikes narrowly missed Marc-Andre ter Stegen’s goal. The German keeper had little to do and was thankful to Nelson Semedo, who produced a great block to prevent Pablo Sarabia from testing him. Barcelona have a four-point lead at the top of La Liga, with Valencia second, Atletico Madrid third and Real Madrid, who play Las Palmas on Sunday, fourth. Sevilla remain in fifth. Earlier, Valencia took their tally of league goals to 30 – level with Barcelona – with a 3-0 win over Leganes. Dani Parejo, Rodrigo and Santi Mina, with a penalty, ensured Los Che continued their great start to the season. Both Barca and Valencia are unbeaten, as are Atletico, although they have drawn five of their 11 games. On Saturday, they avoided a sixth draw thanks to Thomas Partey’s 25-yard stoppage-time effort against Deportivo La Coruna. La Liga! Lionel Messi Scores As Barcelona Beat Sociedad 4-2 To Stretch Gap Ahead Of Real Madrid To 19 Points!